Phone cameras have become mighty impressive in recent years, almost making dedicated cameras redundant. As we push into 2016 the new wave of flagship devices come with formidable camera specs. And having reviewed theLG G5, Samsung Galaxy S7 edge and iPhone 6S Plus in recent months, it’s the perfect opportunity to test these phones cameras’ mettle in a dedicated head-to-head. The headline-grabbing numbers and features of this trio – from megapixels to wide apertures, and laser autofocus to dual cameras – certainly do their job and swing the punches, but what’s the story in the real world and which is the best of the bunch? 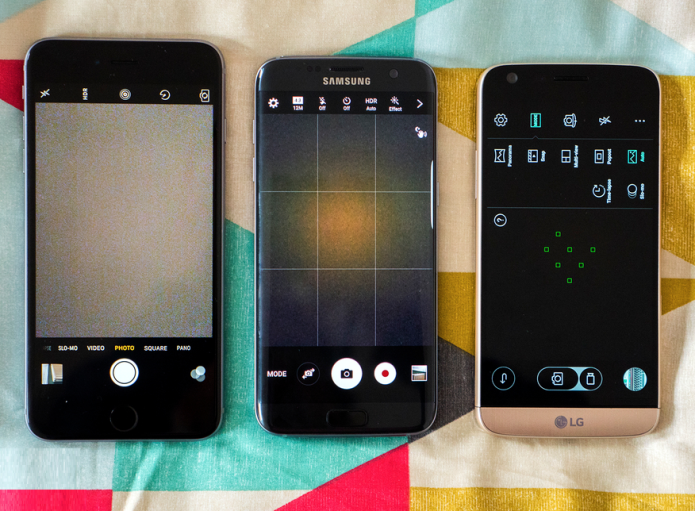 We go deep in our G5 vs SGS7 edge vs iPhone 6S Plus camera showdown. We’ll start with what seems trivial, but phone design, screen size and interface all have an impact on user experience. All three phones here have large displays, the iPhone and Samsung are 5.5-inch, the LG is 5.3-inch. Each has its own fortes and downfalls. The iPhone is the lowest resolution but, really, this doesn’t matter in practice – if anything it looks the best in terms of colour. The SGS7 edge has added pop due to its Super AMOLED panel, so shots off screen look a little flatter, and those curved edges make it a little tricky to use in landscape orientation. But of the three it’s the Samsung we favour the most for two reasons: one, the refresh rate maintains super-smooth playback even in low-light conditions, which is great for framing; and two, the touch shutter is the quickest of the bunch to react and fire off a shot (press-and-hold and it reels off batches of images). One thing the G5 lacks that both iPhone and Galaxy offer is a click-and-drag exposure compensation adjustment. On the iPhone this vertical slider with “sun” symbol is easy and accurate to drag to make subtle adjustments and, for our money, the best implementation. The Galaxy offers a similar solution in a horizontal “lightbulb” slider though. The more light that a lens lets in, the more a camera module has to play with. And as the Samsung has the widest aperture – the smaller the number, the wider the opening, thus the more light – this is part of the reason its real-time playback is so smooth. A wider aperture narrows the focal plane in an image too, which can deliver a more pronounced blurred background (especially when the focus point is closer to the lens). But the differences between the Samsung’s f/1.7 and LG’s f/1.8? It’s negligible; it’s one sixth of an f-stop. Between f/1.7 and the iPhone’s f/2.2, however, it’s five sixths of an f-stop – which, like-for-like, means the sensitivity (ISO) can be kept lower to stop processing having to work so hard. However, and like with the similar resolution between different devices tale, don’t get too hung up on marginal differences in aperture values. The difference is fairly marginal but, even so, it’s the smaller number of the Samsung that sees it the victor here once more. One of those things that’s not discussed too often is phone camera reviews is how wide-angle a lens is. The smaller the number the wider the field of view, which has practical benefits – such as fitting a bunch of people into a group shot – but also exaggerates distortion the wider it gets. 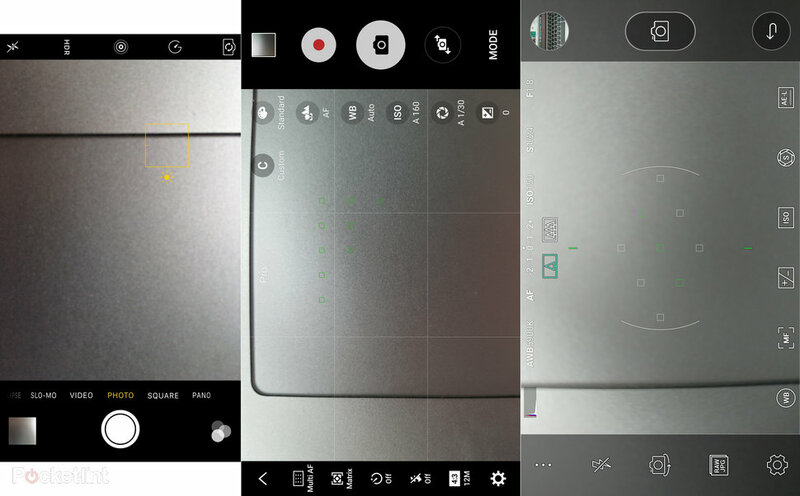 The LG G5 has a clever work-around solution: two cameras. 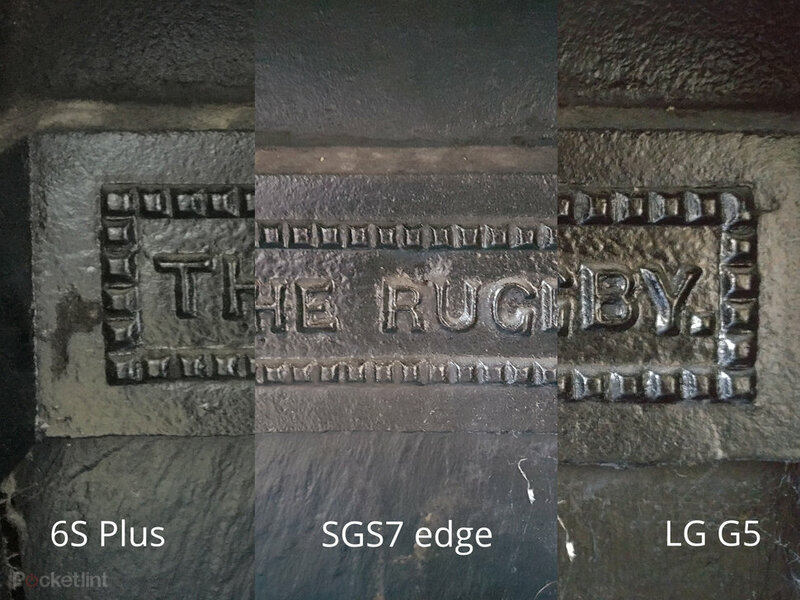 Yep, that’s what the ugly lug on the back of the phone is: one 16MP sensor with an as-yet-unknown official focal length (we’ve compared it to the other two and it’s the least wide-angle of the bunch, somewhere at the 30mm equivalent we suspect), and one 8MP sensor with a far wider 135-degree angle of view (think of a 180-degree line as being your arms outstretched, whereas 135-degrees covers 75 per cent of this periphery). 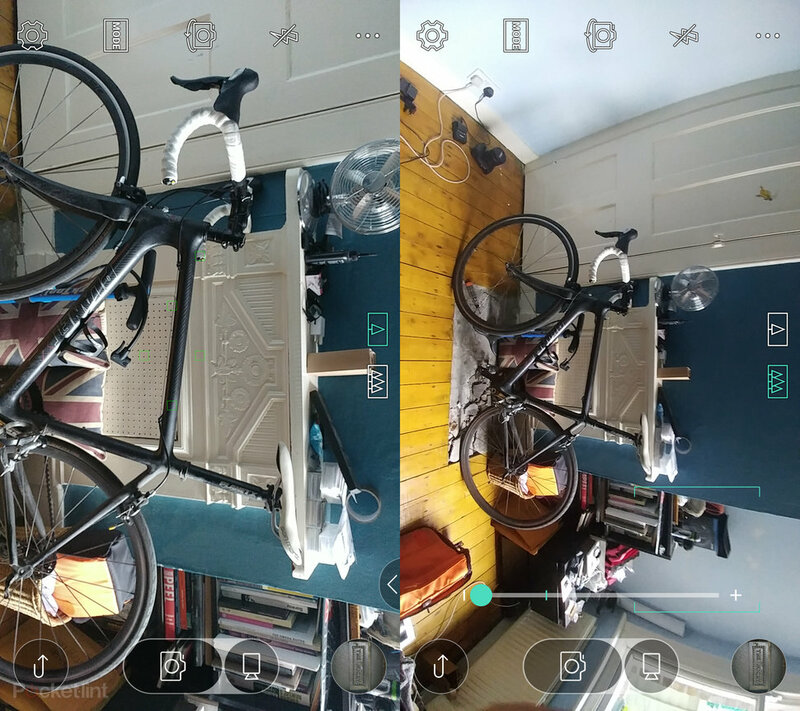 Sounds gimmicky, but we think the super-wide second lens is bloomin’ brilliant – and it’s easy to toggle between the two options within the camera app in a split second. Here the difference between the 26mm of the Samsung and 29mm of theiPhone might sound negligible, but it makes a fair difference in what you’ll squeeze into the frame. We find the Samsung a little too wide perhaps (although it’s arguably the most practical), the iPhone sits in a good sweet spot, while the G5 has perhaps been a little too cautionary with its main camera (but compensates with the ultra-wide second solution). 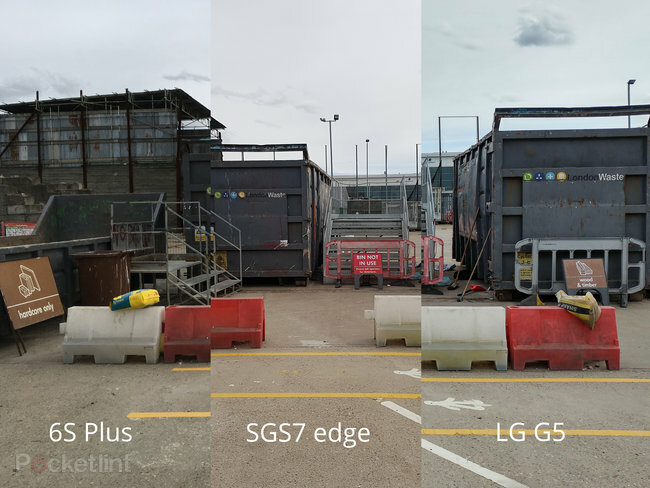 The difference between those two G5 cameras, however, is that the 16MP one can utilise the phone’s laser autofocus system for speedier capture than the 8MP wide-angle’s contrast-detection system. We’re particularly fond of how the G5 provides ample feedback with focus points, or you can press-to-focus anywhere on the screen instead. But just because it’s got a snazzy name and uses actual frickin’ laser beams, does it mean it’s the fastest? Well, yes and no. Point-and-shoot and the G5 is snappy with its pre-defined autofocus points. Break the mould, however, by selecting your own focus point and the SGS7 edge is as fast or faster – depending on the shooting conditions. The iPhone 6S Plus is slightly slower than the other two handsets, but not by a giant amount. Accuracy, however, we’d give to the G5. Even when it’s being a little slower to acquire focus than the S7 edge the G5’s small focus area seems more precise – almost thoughtful – in its acquisition. But if it’s all-round speed then, perhaps surprisingly, the SGS7 edge, on average, is the nippiest of the bunch in our experience. Not so long ago optical image stabilisation was a relative rarity in phone cameras. Not so for this trio, though, each of which uses microscopic lens-based movements to counteract for handshake and movement. That’s especially helpful for keeping shots sharp when the light dips. It’s all rather clever, isn’t it? But which is best? Each maker has their own claims (or absence of) on how effective systems are by x-amount of f-stops, but we can’t pick one from the other. In bright conditions you’ll know no different, it’s when the light fades things kick in. What is apparent, however, is that the differing available aperture values make the biggest difference: we’ve more often found the iPhone using 1/4-second shutter speeds compared to 1/15th-second of the SGS7, making the Samsung easier to hold steady for sharper results, for example. We’re not going to get too hung up on manual shooting ability, as a lot of phone users aren’t going to need or want such controls. Phone makers know this, and even the Samsung Galaxy S7 edge’s and LG G5’s manual modes – named “Pro” and “Manual” respectively within the “Modes” section of the app – are neatly tucked away by default. But if you do want shutter speed, ISO sensitivity, raw capture and other controls then these two cameras offer them. The iPhone sticks to its straightforward usability premise, without a full manual mode or raw capture, but with easy-to-use exposure compensation – plus there are third-party apps that can be downloaded to make yet more out of the 6S Plus’ camera arrangement. We’ve even had rather a lot of fun with the DxOOne camera add-on. There’s a lot of talk about resolution these days. But think of it like this: even a 4K Ultra-HD TV delivers 8.3-megapixels, which is more than enough resolution for a still image, so anything at that number or greater means it’s happy days. But – and there’s always a but – you don’t want too much resolution (i.e. photodiodes, which translate into pixels) crammed onto a small sensor surface. Doing so causes issues with the ability to capture light as “cleanly”, which can result in images with more image noise present – that mottled, dotted pattern, which can also show as red, green or blue colour noise. To counteract, makers are aiming to squeeze slightly larger sensors into phones, while maintaining the sweet spot of resolution. 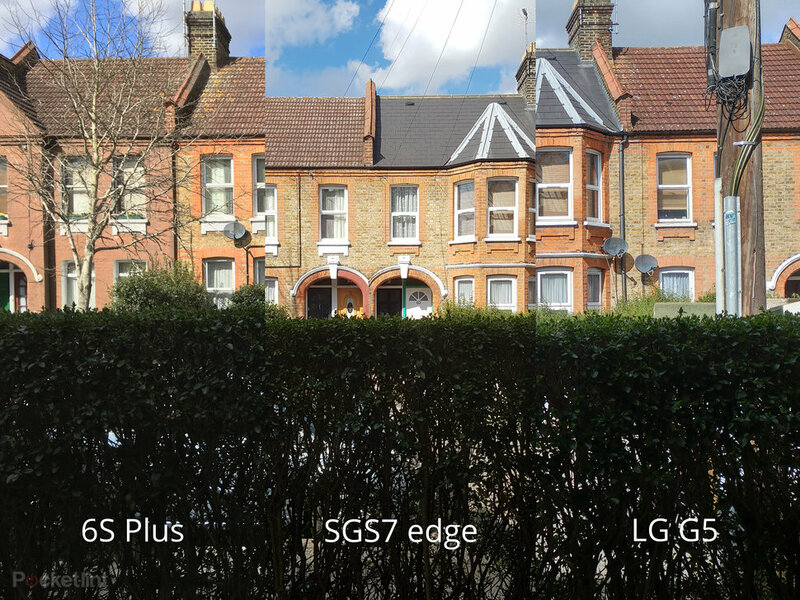 So while the iPhone 6S Plus has a decent sensor, the LG G5 and SGS7 edge both use a slightly larger surface. The spread of resolution is therefore different: while the iPhone 6S Plus has the same resolution as the SGS7, the Apple device’s smaller surface means each “pixel” is smaller. But not the smallest: the G5’s higher resolution means squeezing more pixels onto the surfaces makes each one smaller. That runs the risk of lesser image quality – but clever processing can counteract such assumptions. So, to the actual results. 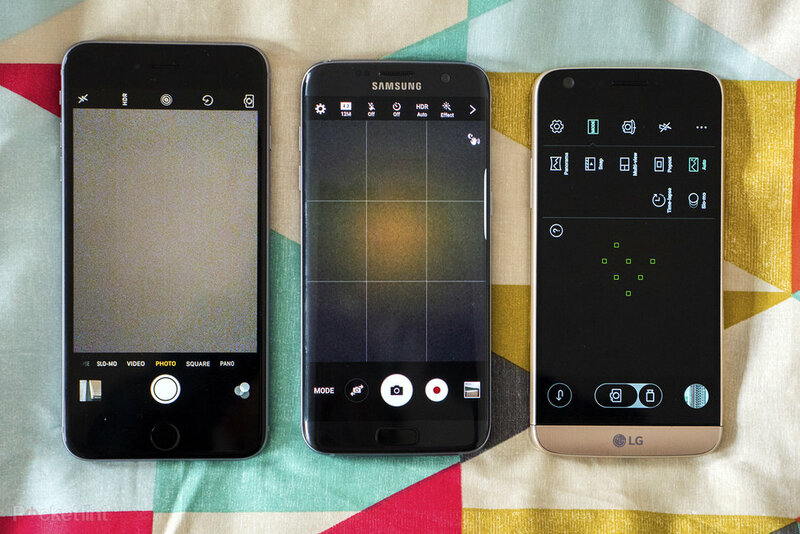 We’ve been shooting with all three phones in daylight through to low-light to see how they perform. Comparing actual results between all three is tricky because we’re not comparing like-for-like settings in each case: if the camera chooses a slower shutter speed because its aperture can’t equal the settings of a competitor, then we can’t control that across all three devices. Our comparison, therefore, is very much a real-world “here’s what the device does” and how the results thereof compare. And it’s with quality that the iPhone shows its worth: of all the shots, from all three phones, the balance of colour and contrast throughout the 6S Plus’ shots gives it the most immediate appeal; its shots look the most “camera like” straight out of the device which, to a fair degree, makes it the most appealing. We found its HDR (high dynamic range, which balances highlights and shadows) results the most pleasing too. When zooming in that little extra, to really dig at the detail at 100 per cent scale, it’s actually the Samsung that can eke out a little extra – a combination of widest aperture and largest “pixels” on sensor being the helping hand here. However its the least accurate when it comes to colour, often with very pink/magenta tones throwing things off, and contrast that is often excessive. Processing can also be harsh in areas and diminish detail in lower-light shots. The G5 is an interesting balance because it doesn’t go wild on the processing front, therefore not pushing contrast to excess or smoothing out details to mush. 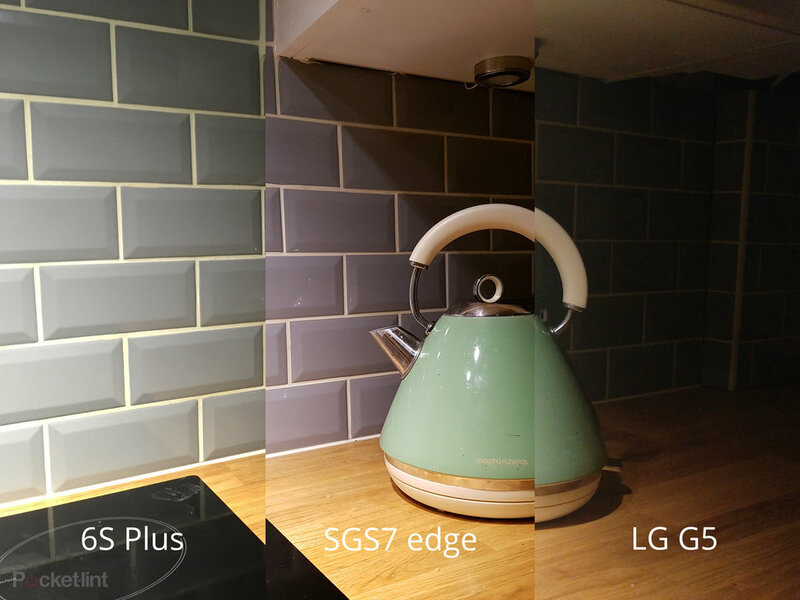 In a way, the LG gives the most raw-like results of the three devices, with plenty of detail to boot, but also a little more colour noise as a result when shooting in low-light conditions – not that it’s hugely noticeable. The added resolution of the 16MP camera (and therefore smallest pixels) doesn’t make a vast difference nor hinder results, but on balance it’s perhaps exactly that: the most balanced of the three. As you might have seen on the telly, Apple is pushing its Live Photos feature quite hard in the iPhone. The idea is simple: a still image “comes to life” when you touch it (well, within an Apple ecosystem anyway, it’s not shareable withAndroid phones in such a format) with moving image and sound. Fun, but not brand new – we’ve seen such ideas before in HTC and Nokia devices. Even theS7 edge offers a similar, but far more tucked-away feature. With the LG G5 there’s a significant addition in the make-up of the handset too: modules or “Friends” as LG likes to call them. These physical add-ons vary from a VR headset to a hi-res audio addition. But it’s the camera extras that are most interesting, with a battery-and-controls-boosting addition available (which we’ve not used for this test, to be clear) and even a dual lens 360-degree camera. All three cameras have dual tone flashes to make the most of warmer skin tones as needed. It was a stand-out feature when first introduced, but now seems to just be the going standard. Apple hit a home run with its slow-mo modes, which are still the most accessible and varied of the three devices here – it’s the only one to offer 1080p at 120fps, for example, the other two have 720p at 240fps only. The other big news, but of course, is 4K capture. Which all three devices offer at 30fps, keeping up with the current trends and ensuring that true flagship experience. None of the devices can play it back pixel-for-pixel on the native phone screen, of course, but that’s besides the point. Which brings us to the wrap-up. And it’s not as clean-cut as we thought it might be. There are all kinds of additional depths. 1. The iPhone’s images are the most pleasing straight from the device. However, it’s not the fastest to focus and sometimes conditions can get the better of it. 2. The Samsung offers the snappiest user experience. However, its images, while often the most detailed of the bunch, are the most colour-skewed. 3. The LG’s dual camera approach is a stroke of brilliance – and we’re big fans of the 135-degree second camera. Overall it’s the most balanced of the three: delivering good image quality, without overdoing processing, and delivering an accurate autofocus experience. In many ways, that makes it the best of the bunch – depending, of course, on what you’re looking for. Force our hand and, well, we’d probably pick the S7 edge. One, because it’s the most exciting phone of the bunch; two because we’d be ok spending a little extra time applying new colour filters to any shots taken. Whichever you choose, this current collection of flagship smartphones offer an excellent camera experience.